Most people think success comes from good luck or enormous talent, but many successful people achieve their accomplishments in a simpler way: through self-discipline. Brian Tracy knows this firsthand: He didn't graduate from high school, and after working for a few years as a laborer, he realized he had limited skills and a limited future. But through the power of self-discipline, he changed his life, achieving success in sales and marketing, investing, real estate development, and management consulting. He has consulted to more than 1,000 companies, given motivational speeches and seminars to more than 4 million people in 40 countries, and written 45 books. 1. Your personal goals: self-discipline can help you realize that you are responsible for your success and shows you how persistence really does pay off. 2. Your business and money goals: self-discipline can make you a better leader and a better manager, help you close more sales and make more money, improve your time-management and problem- solving abilities, and make you more effective and successful at work. 3. Your overall happiness: self-discipline can help you be happier, healthier, and more physically fit, and it can help you in your marriage and your relationships with your children and friends. 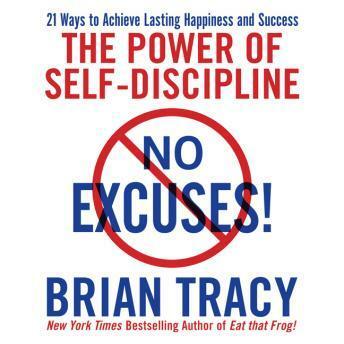 Each of the 21 chapters in this audio book shows you how to be more disciplined in one aspect of your life, with end- of-chapter exercises to help you apply the "no excuses" approach to your own life. With these guidelines, you can learn how to be more successful in everything you do-instead of wistfully envying others who you think are just "luckier" than you. a little self-discipline goes a long way...so stop making excuses and listen to this audio book! I really enjoyed this book. I liked that he paused while reading to give you time to hear it. My favourite thing about the app is that it continues playing from where I left off!! So useful. No more searching for where I was!! I truly enjoyed this book. It was informative and motivational. The flow of the narrator was comforting and allows the reader to understand and accept the suggestions made in the book. This is a really good book and such a brilliant concept to rethink and review life and our everyday decisions. Unfortunately I couldn’t get on with the narrator, I found it hard to hear and there was background noise such as sirens, shuffling etc. Content is Great. Very difficult to stay with his voice though. Too monotone. Clear speaking voice though. I like the reader's voice so much. It's very suitable for instruction. I've learned a lot and would strive to practice these in my life, all the rest of it. Powerful. Very convincing. Voice is perfect. Good and sound advice. Excellent book!!!! Very useful and informative. I highly recommend this book!! !